The city is good, almost everyone who was looking for the second or the third job, found it. Nice city, it's all at walking distance, and it's very safe. 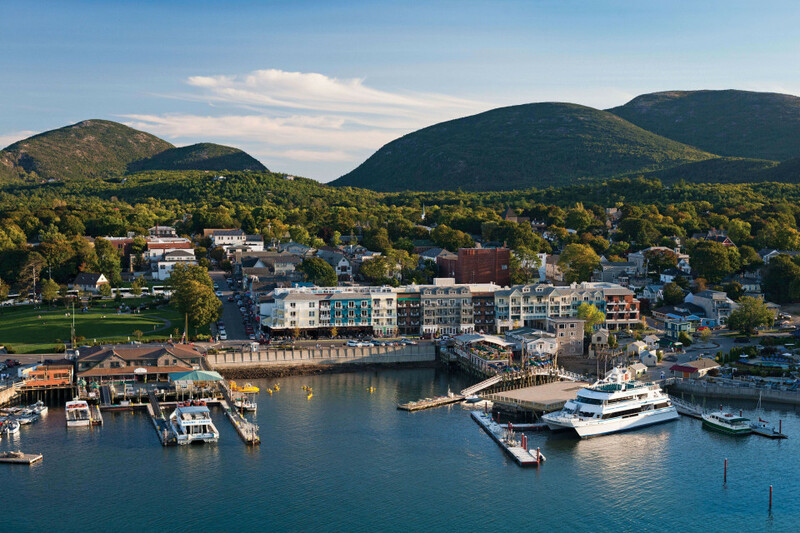 Bar Harbor is located on the slopes of the Acadia National Park, so if you are nature and hiking lovers, this is a great place for you. The city is very beautiful, a lot of beautiful experiences and memories. First, I went to first offer I get, and it was Bar Harbor. Honestly, I've never heard of this place but what I immediately liked the fact that it is on an island that is a national park. I can tell you that I made a mistake because the nature of the beautiful ocean just as many cold and not really for swimming, only for the very brave. On the island, where there are more lakes can swim, but you have to find them because they are part of hiking trails. Also on these tracks hiking "win" the mountain tops because of some real challenge to climb and can be dangerous. Therefore, follow the instructions and do not deviate from the trail. For those who like to cruise, secured boat tours are free with proof that you work for a company OPL. The town is very small and the people are very kind. Everyone will come out to meet you for everything you need. Small town has its advantages because you can get everywhere on foot and somehow life is completely calm and stress-free (at least that's how I experienced). For all gluttonous, there are a lot of different restaurants (except Serbian, but there are a barbecue in the yard so that the Serbs gather the rest of the world: D). Nightclubs are not something, because there is only one pub and one bar open until 1 am. Thursdays is organized Balkan greater if take our music. The location is fantastic. It is the northernmost island that belongs to the state of the eastern coast of the US. The island is a tourist very well attended during the summer season by some people of the older generation, but there are also young people. If you love nature this is the right choice for you. Hiking paths, sports fields, forests, lakes and the ocean. All these wonderful things can be used, and brighten you free days in Bar Harbor. There is also a club to the soul of our conditions to work only after one night, but I believe will be future participants and the attachments to it very quickly. All in all a small but beautiful place otherwise declared for the best location for cruise port which also has throughout the season. Offer to go to Bar Harbor I got last year at this time (end of November). I'll be honest, until then, never in my life have I heard of Bar Harbor and Acadia National Park (one of the most famous in the USA). I searched the forums, youtube and google to find some feedback from people who were there before me, but unfortunately, each search was unsucsesful. The closest I could find the experience from a small village on the same island that was several years old. Therefore, I want to share my experience with people who will go there next year. Bar Harbor is a beautiful little town on the coast of the ocean. There was not much J1 students what is has shown as a very positive thing. There is work as much as you can do, I specifically worked 4 jobs. I returned home with good money, so strongly recommend going there. Job opportunities are plenty, only you need to arrive in mid-June and be persistent. Go for the employer continuously and preferably solo. Employers on the island rarely gives overtime. ENTERTAINMENT ON THE ISLANDS Lets say that this island is the paradise for retirees. There is only one club and it ends its work in 1 after midnight. The club starts to take full around 11:30, so night life is not fantastical. On the other hand, here you have the opportunity to enjoy the beautiful nature. I suggest that you go for a swim with the Americans to the lake Long Pond. Lake is like from a farytail, you need a car to get there, the lake is located between two mountains. If you dont like swiming in cold water there is a large number of hiking trails, some of which I would mention Beehive (slightly lighter) and the Precipice (slightly heavier, but it's worth the effort). You can also enjoy tours on the ships. Suggest Nature cruise, cruise Margaret Thode and kayaking (kayak I could not do, but it's a very good thing judging by others' experiences). To note, one of the benefits for the workers of this island is that they have the right to ALL, absolutely ALL tours to ride for free. Americans, for example, will pay 60 $ to go to watch the whales while you shall appear with the jacket and proof that you are a worker (mainly part of the check) and enjoy the beauty of the island. In addition, as of the end of June on the island start to work Island Explorer buses. These are free buses that drive you all around the island. Some sites you can visit by this bus (Beehive, Precipice, Sand Beach, Jordan Pond), while others can not (Long Pond, Cadillac Mnt ...) There is no any purchases on the island, there are several stores with a sports equipment but the prices are worse than with us. The nearest town for shopping are in Bangor. There you have a TJ Maxx and Bangor mall, where you can find anything from clothes for ridiculous money. Great place , another job was in the Dunkin Donuts as a seller, a lot of girls and bars to hang out . It is very easy to find second job who wants to work.